So Apple's shiny new OS is out and there are a few adjustments every C++ developer needs to know. (Note: This is for people using Eclipse or a similar IDE, not XCode). First you'll need to go to the App Store and install the latest version of XCode. If you use Eclipse (or probably any IDE) I recommend checking for updates. In Eclipse look for the option "Check for Updates" under the Help menu. Next fire up Terminal, we need to install some stuff. This installs the command line tools that Eclipse needs. You'll be prompted for your admin password. Next if you like to use and install open source software you'll need to reinstall a few things. You probably already have a directory you download and install packages from but if not create something like ~/packages and work from there. (Thanks to https://wiki.documentfoundation.org/Development/BuildingOnMac for the following instructions). Finally you'll probably need to rebuild and relink any projects you have in Eclipse. Remember to do a clean first so everything gets rebuilt. In this simple proof of concept I asked ten people to process a receipt, giving information about the business, date of purchase and the category of purchase. Some of this is clearly possibly to automate with OCR however the detail and accuracy required to make this useful makes this a good candidate for a Mechanical Turk task. So how did people do? Well it took about 20 minutes for all 10 HITS to be processed. That's not too bad, and I'm sure response time is highly sensitive to price. I suspect 11 cents for each of these hits is on the high side since the time it takes to process one of these is probably 30 seconds or so at most. That said this is an interesting design decision you have to make, it's pretty clear that response times are not going to be very predictable, and definitely not particularly close to real time unless you pay a significant premium. If you really have a popular application and people get to know your tasks (something you can easily do with MTurk) then you might begin to achieve more consistent and quicker results. Especially since the system allows you to tip particularly diligent workers. As for accuracy, all ten people correctly identified the business and 9 out of 10 got the date right. The one person who didn't reversed the month and day despite explicit instructions in the HIT to watch out for this. The context of the receipt should have been pretty clear it was from the US, but I suppose its possible the actual mistake made was thinking this was a non-US receipt and my instruction led to confusion that it should be switched. As for categorization, it was all over the place, I would rate 3 out of 10 as correct answers (something along the line of hardware or home improvement). Many people put food, although there was a food item it was only a small part of the total and the directions were to categorize the most significant part of the purchase. In a full up application I would need to implement a drop down menu or multiple choice mechanism to get consistent categories but the issue of 5 out of 10 categorizing as food is a fundamentally different problem. I will need to experiment with better directions to see if I can improve this accuracy. MTurk provides a way to have a second person validate the result of the first person. This of course increases cost because it's a separate HIT and would lower response time as well but it appears to be a necessary step in quality control. MTurk also lets you "qualify" people which might help in this case, for instance I need people who understand english well enough to decrypt the extreme abbreviations that are on some receipts and can use context like this was a hardware store receipt to help with categorization. One fascinating idea might be to try and preprocess receipts with OCR and use MTurk for confirmation and correction instead. Recall that the goal of this proof of concept is to develop a system that can accurately and automatically categorize receipts for a program like quicken or mint and make it easier for people to use that information for more detailed budgeting and money management. Overall I think MTurk presents some unique capabilities that have not been widely exploited especially in consumer applications. However there are challenges and being able to afford MTurk even for just a few cents per transaction will be a barrier for many possible applications. The process of developing for the Mechanical Turk (MTurk) revolves around creating HITs (Human Intelligence Tasks). To use MTurk you write a program (in a choice of languages) that create one or more HITs which are then processed by humans. A hit is a self-contained entity that explains the task, gives information needed to solve the task and asks for one or more answers. Each HIT is worth some amount of money specified by the creator (typically a few cents). As HITs are completed you can also automate data collection and payment for the HITs. There are a variety of quality control mechanisms in place but quality control remains a critical path of development. Amazon has a nice getting started guide called Mechanical Turk Getting Started Guide. It supports a variety of languages including command line, C#, Java, Perl, and Ruby. My work shown here is based on examples from that guide using the Java SDK and Eclipse. Built into MTurk the user can provide three types of answers: Free form text, multiple choice, and file upload. However because you can host the HIT on your own website it can actually be anything, an HTML form or a java applet for instance. For this example I wrote code to display a receipt, and ask three free form questions about it: What was the date of purchase, what was the name of the store, and what was the category of the spending. I was impressed with the speed of development. I went from knowing nothing about MTurk to having answers back from real users in the production HIT environment in about three hours. Your task is to examine the image of the receipt shown below and answer some basic information about it. If any information is unreadable or unavailable for some reason put unknown. This is actually pretty easy to read. The first part is a description of the task and then there are four questions. (The last question is a request for suggestions). 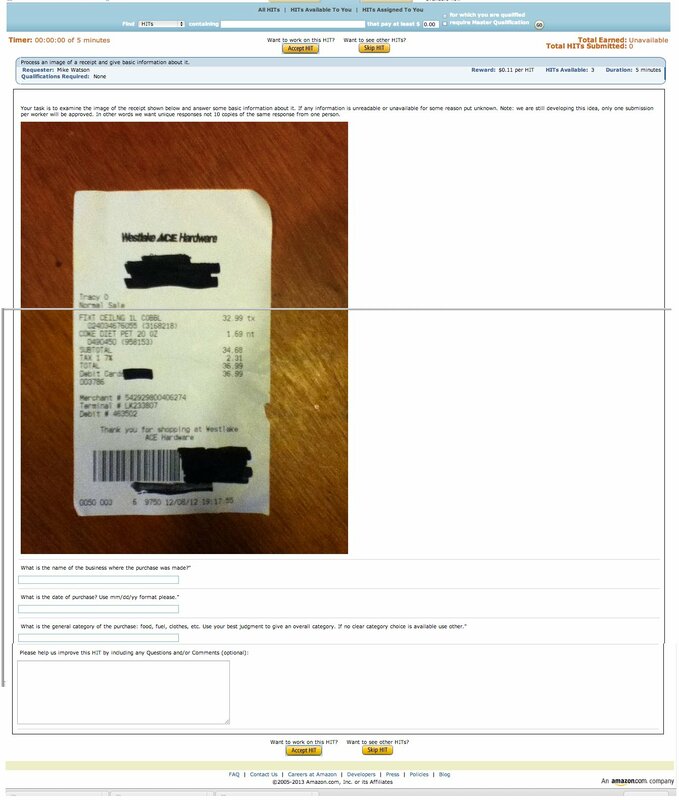 * Copyright 2007-2012 Amazon Technologies, Inc.
* This is a try at using the Mechanical turk to process photographs of receipts. * mturk.properties must be found in the current file path. * @return true if there are sufficient funds. False if not. * and the HIT will be created on Mechanical Turk. //the HIT attributes externally as a file and be able to modify it without recompiling your code. //In this sample, the qualification is defined in the properties file. //Loading the question (QAP) file. // Validate the question (QAP) against the XSD Schema before making the call. // If there is an error in the question, ValidationException gets thrown. // This method is extremely useful in debugging your QAP. Use it often. System.out.println("You may see your HIT with HITTypeId '"
//The validation exceptions will provide good insight into where in the QAP has errors. //it easier to find and fix issues. Each time this program is executed it creates one or more HITs based on the question file. The HITs go to either the sandbox where you can look at them and work on them yourself for free, or to the production environment where people will work on them for real money. One last file is needed to make this work, a properties file that defines configuration information. Particularly if you are creating HITs in the sandbox or production environment. # Mechanical Turk Requester account. title:Process an image of a receipt and give basic information about it. description:The task is to review a receipt, enter information about that receipt including date, time, company, and a categorization of the spending such as "groceries"
Next time I'll talk about the effectiveness of using the Mechanical Turk. Last time I discussed how using a QR code to categorize receipts would make data entry easier. Unfortunately this solution requires the cooperation of the stores. While easily doable it is hard to get the momentum going to add such a feature. Another thought I had at the same time was using Amazon's Mechanical Turk to do a similar process. I have actually implemented a simple version of this and run a few examples through the production Turk. I think people will find this very interesting both for the specific problem and for a good, yet still fairly simple example of using MTurk (as Amazon likes to call it). See https://www.mturk.com/mturk/welcome for the official Amazon site. First, for those not familiar, MTurk is a platform that allows the creation of small tasks that are meant to be done by real people in exchange for a small fee, typically a few cents. Examples tend to include "identify the color of the automobile in a picture" or "determine the hours of operation at a particular business". These are trivially easy for a person to accomplish but not for a computer. So the idea is to submit the image to MTurk and let a human do the job in a few seconds. I found this a very interesting experiment both from the software and human perspective. It is true that MTurk costs real money but I spent less than $5.00 on my experiments and you can spend nothing to use and develop for it, it only costs money when real people start actually working for you. To keep this from being an enormous blog post I am going to split this up over several posts and include implementation details later. I will end here with a screen shot of what the person saw when they processed my receipt using MTurk. Keep in mind we are still at an experimental stage and more information would be added in the future. (cc) Non Commercial Share Alike. Awesome Inc. theme. Powered by Blogger.